The Electric Imp range of IoT devices offer a simple means to interface with a number of different physical data collection devices and connect back to a central controlling Server Platform via built-in WiFi. Code can be written and deployed from the central Server Platform that controls how the collected data is made available. My original article on the Imp was based on a simple implementation that just used the internal light sensor in an Electric Imp passing back data via Cloud Servers to Zabbix and visualising on a Grafana Dashboard. 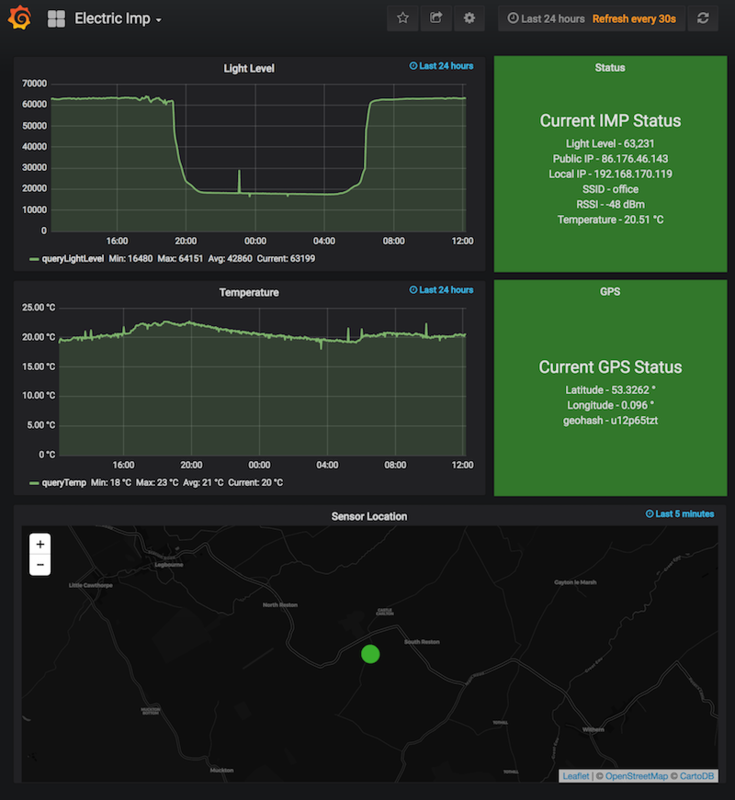 Using the same infrastructure of the Imp, the central Cloud Servers, Zabbix and Grafana, I extended the data collection capabilities by adding a temperature sensor and GPS receiver. Interestingly, when you put all this together there are no external electronic components as it's all constructed from the Imp itself and the sensors which are just wired together. In the above picture this is done using a "Breadboard" with fly leads but this could easily be constructed in a case with battery power. The Grafana Dashboard was also extended to show the temperature and GPS data. The position from the GPS receiver is also showed on a map. The Electric Imp range of IoT devices offer a simple means to interface with a number of different physical data collection devices and connect back to a central controlling Server Platform via built-in WiFi. Code can be written and deployed from the central Server Platform that controls how the collected data is made available. In the following example I have used the built-in light level sensor data and exposed it via a simple web interface on the Server Platform. This data is collected and stored by a Zabbix Server and presented via a Grafana Dashboard. The Electric Imp itself is packaged in an SD Card like enclosure which can be plugged into a number of different SD Card type sockets to give connectivity to power and physical interfaces. 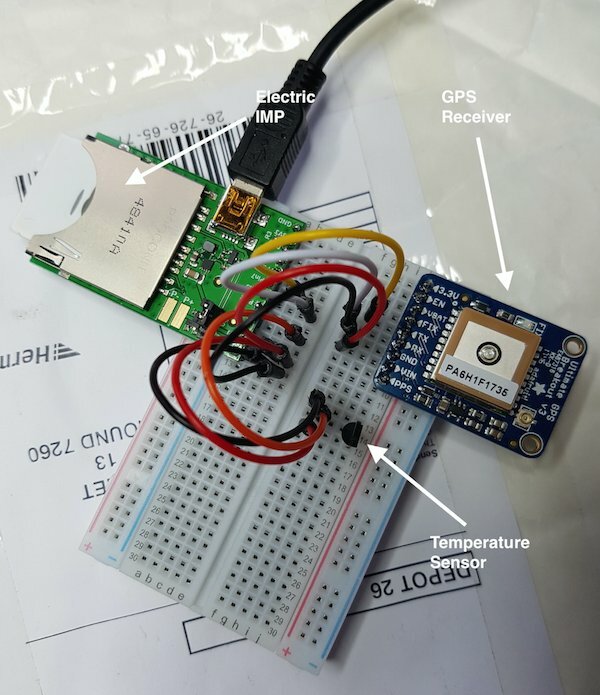 The Electric Imp has a light level sensor inside the SD Card type package that is used to read configuration instructions from a Smart Phone App (BlinkUp) to setup the WiFi parameters and can be used as a Light Sensor at run-time. Once configured and connected to a WiFi Network with Internet connectivity, the Electric Imp connects to the central Imp Cloud from which it will download any updates and Device code created for the device. The Imp Cloud will also have Agent code that runs on the Imp Cloud and controls communication between the Imp Cloud and the device. 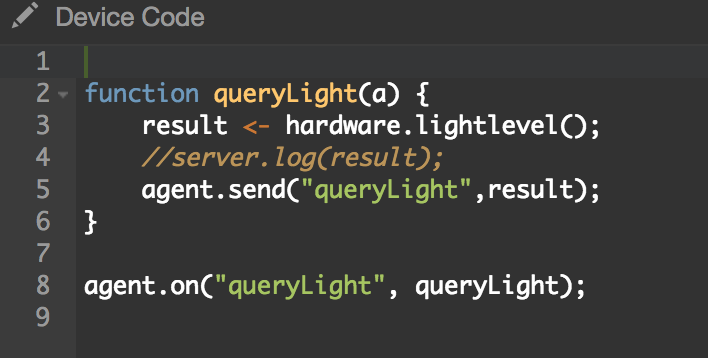 The Imp Device code used simply registers a function to be called when and Agent message of type "queryLight" arrives. When the function is called by the arrival of the message it reads the hardware lightlevel and sends that back to the Agent. 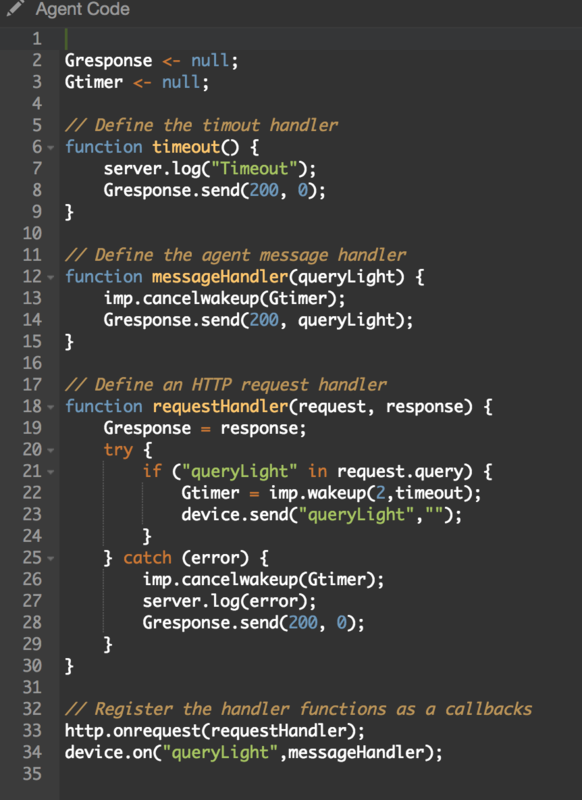 The Imp Agent code used is a little more complicated but all it does is to get triggered when a http get request arrives (the URL to use for the specific device is shown in the Development environment on Imp Cloud), sends a message to the device and passes the reply back as the http response. There is also code to handle timeouts communicating with the device. If there is any error communicating, a zero value is returned on the http response. The data is then held on the Zabbix Server and used by a Grafana Dashboard to show a graph of the level and a status panel which shows red if there is a problem communicating with the device. I needed to install Asterisk 13.10, FreePBX 14.0 on Ubuntu 16.04 LTS in an Amazon Lightsail instance. I based the installation process on a set of installation notes on the FreePBX site but this was based on Ubuntu 14.04 LTS on bare metal. Ubuntu 16.04 needed a few changes to the procedure which was further complicated by the Amazon Lightsail customised image. So the following takes into account these requirements. Its not been fully tested yet but does install and run. The Lightsail instances was 2GB RAM 40GB Disk and a static IP. After each login, I use sudo to get the system into root mode. There will be people out there that tut tut at me for that! Step 1 - Added a swap file and get Ubuntu up to date. Step 2 - Install a bunch of pre-requisites. This includes PHP 5.6 which FreePBX 13 needs (module updates will not work with PHP 7 installed) hense the use of an external repository. Step 3 - Install some more required packages with versions that are not in the standard Ubuntu repository. nodejs 6 and a version of libmyodbc that works. myodbc-installer -a -d -n "MySQL ODBC 5.3 Driver" -t "Driver=/usr/local/lib/libmyodbc5a.so"
Step 4 - Asterisk (with some config file adjustments) and FreePBX.